I must have used a LOT of glue....once yer kidlets' creations are dry, punch a hole near the top of the lid, thread some string, ribbon or yarn through it and hang it up. Pretty! Pop Happy for Popcorn Day! Happy Popcorn Day! Here's a nifty bit of artsy-ness that includes a wee bit of recycling and a whole LOT of glue! Set out your materials on a sheet of wax paper or your handy dandy splat mat (a couple of plastic placemats will work in a pinch). Prep your colored glue. This part will work best if you can make a couple of bottles of colored glue to have on hand. Kidlets can of course use a paintbrush to use the glue as paint but what fun is that? It's all about the SQUEEZING! If you can, pick up a couple of the tiny bottles of white glue. Back to school time is great for discounts but you can always pick up a couple of larger bottles at the dollar store. Add a few drops of food color or liquid watercolor, put the cap back on and shake, shake, shake! Rest the bottles upside down to help get the color mixed into the glue. If you have a small squeeze bottle floating about, mix up your wee one's favorite color into some glue and have them use that. Remember, kidlets will use as much glue as you give them so keep the quantity down othrwise you will have a mountain of glue dripping all over the place. Not only would that be wasteful, it would be MESSY! You don't have to use a clear plastic lid but the clear plastic will allow for pretty sunlight to stream through if you choose to hang this piece of art. A yogurt lid or any other plastic lid will work but if you are a person who hits Starbucks quite often, these lids are PERFECT! Flip your lid over so that the top faces you. Tape up the straw opening with a couple of pieces of tape and flip over so the top is resting on the table. Now it is time for the first batch of glue! Have your wee one squeeze as much glue as they like into the lid. If you have the lid facing the right way you will have a small lip to hold the glue in. The goal is to coat the bottom of the lid with glue. If your wee one is getting a little too glue happy, cut them off by handing them a bottle of colored glue. Encourage them to squeeze a little color into the lid also. Next up is popcorn! While I am sure you and your wee ones are snacking away on the popcorn, don't forget to add some to the lidful of glue, a few pieces at a time. The idea is to layer. Glue, popcorn, glue, popcorn, etc. So go ahead and add some popcorn to the mix... Add some more glue in a different color perhaps and then add a dash or two of glitter, add some more popcorn, more glue, pom-pons and what have you. Eventually your wee one will decide he or she is done and their lid will look a little something like this: Set aside overnight to dry and check back here for the next step. Mine is still all gluey so I have to wait also. Make sure to have more than one lid on hand so that your kidlet can make a couple of these. Experiment with other disposable items. You may want to use the plastic container the lettuce came in just cut the sides down a little bit and tape up those holes! Have fun! Hooray for Hat Day 2008! Yay! It's Hat Day! 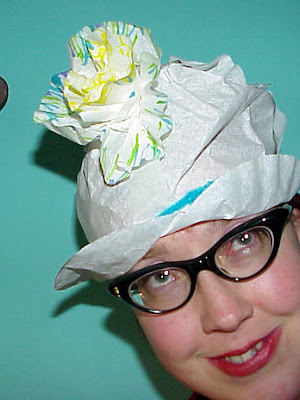 Here's a nifty hat you can make from around the house supplies! Set out your supplies on a splat mat or other mess friendly surface. Each kidlet should get one paper plate to transform. If your plates are white, have your wee ones paint, color or draw on them to fancy 'em up a bit. I painted mine. Do this to both sides so make sure to allow time for side one to dry. Have your wee ones pick a side to be the top of their hat. (You may want them to do this before they paint as the top of the plate will make for a better surface to stick things on. At least, it will keep the glue from dripping everywhere!) They are going to fancy it up with long paper strips that have been cut or torn by your or them. They may dribble glue all over the top and then add their paper scraps or they may use tape to secure them. It all depends on what type of sticky your kidlet prefers. As your wee ones fancy up their hats, have them think TALL. Bend one end of a strip of paper and adhere to the plate then let it loop a little before securing the other end or maybe don't secure it at all. If you are using pipe cleaners, make sure the tape is out. Pipe cleaners are not exactly glue friendly and that can be frustrating for your wee ones. If your wee ones are not so wee, you can up the ante on this project and have them do a sort of weave to decorate. You will need to cut a bunch of slits in the plate using an exacto knife or blade. NEVER let your wee ones near an exacto blade! Do this as soon as their plates have dried and with your wee ones far away from your sides. Then, your kidlets can slip the paper into the slits to anchor each side. Once all their bits of pipe cleaners and paper are arranged, flip the plate over and secure with tape. This is a little more hands on but it allows for some good moments of hand to eye coordination, problem solving and small motor skills. Once their hats are all fancied up, set aside so that the glue may dry if glue was used. Otherwise, you can either staple two strings of ribbon, yarn or twine, one to either side of the plate or you can punch a hole in each side and knot a stand of ribbon on each side. It is all up to you and your wee ones. Place a hat on top of a head and tie under the chin and viola! Fancy hats! If the hat is slip, slip, slipping about, tape a small square of foam or felt to the center of the bottom of the plate. This will help a wee bit with all the sliding. Make sure to take pictures! Not every kidlet likes the feel of something tied under their chin! Howdy folks! Tomorrow is Hat Day! What kind of hat are you going to make? Grab yourself some around the house supplies like coffee filters, paper plates, paper bags, newspaper...you can make a hat out of almost anything! We would love to see pictures or read your ideas. Make a hat and share it with us! Check back tomorrow for a nifty Hat How To, or, you can take a gander at last year's post.